How to by-pass a dynamo hub and link to battery instead? The halogne light and rear is decent, and the connection looks straight forward with just 2 wires, is there a way to splice in a battery pack instead? I rather carry a static battery weight then to deal with the drag. I think you are overestimating the drag. A wheel spin test like in the videos linked tells you nothing. Does 2.5W really matter to the convenience of a dynamo? Some certainly would answer yes, but it depends on your performance needs and how much night time riding you do. Personally I'd love a dynamo but not worth the retrofit, but my ideal commuter would have a dynamo. To be honest I think my wheel is even worse than what the videos show esp when the lights are engaged. I'd already sent the wheel four a servicing and tune up and I'm still not pleased. If I'd to do it all over I wouldn't have gotten a dynamo on the small wheeled bike. I hope I'm not being a pain. But before you take the plunge you should recognize what is an issue and what isn't. "To be honest I think my wheel is even worse than what the videos show esp when the lights are engaged. I'd already sent the wheel four a servicing and tune up and I'm still not pleased." All that is to be expected. 2watts of drag is significant amount of drag on wheel free spinning in air, even more significant on a small light wheel with low rotational inertia. With lights on and 7watts of course the wheel will stop rapidly. But this has little relevance to performance while riding. I understand what you are saying, that with the momentum of the entire person+bike , the impact of the draw of power is less. The thing is; I can feel the difference when riding with the lights engaged vs when it's disengaged, and it certainly doesn't feel minuscule or anything like 1%. True. The 1% claims I made were based on lights off, higher speeds and on time. I agree with Human909. That spinning video tells you nothing about the drag in the real world. A dynamo works by spinning coiled wire inside magnets. With no additional external input, of course the magnets will stop the wheel rather quickly. For me, the convenience of dynamo lights on a commute bike far outweigh the very minor energy losses from the hub. The lights are always there, always on, all the time. 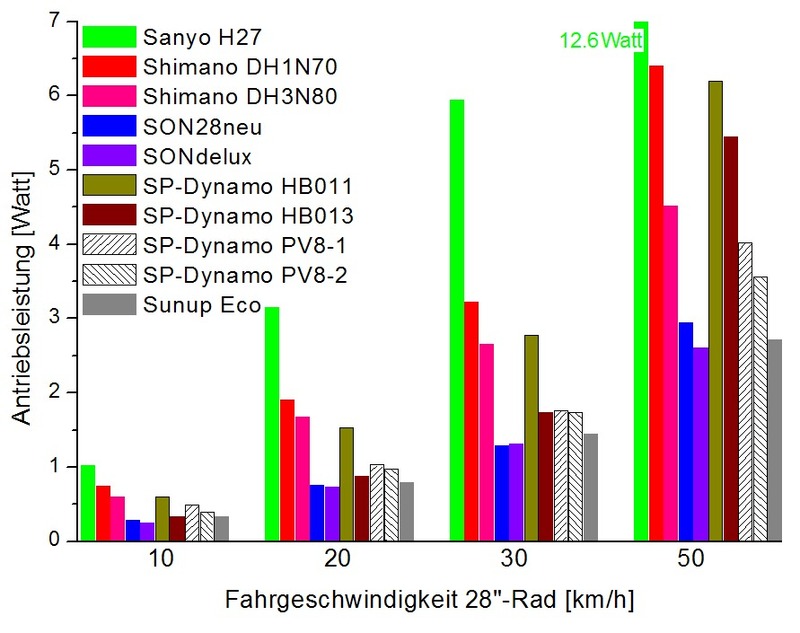 And dynamos on small wheeled bikes are ace because the faster wheel rotation for a given travelling speed means the lights are up to full power that much more quickly. I will never own another commuting bike that doesn't have a full dynamo set up with wired in front and rear lights. Ta, yes, but take it as a science/curiosity question ? Well here's some science: run LED lights not halogen. These draw less power so the dynamo drag is less. More like the lights off curve. You could also put in a battery or supercapacitor as well, fed via diode of course. This could be designed to mostly top up while you go fast ie. downhill. I like my dynamo Gazelle BTW. No thinking at all, just ride it. I leave the lights on permanently. I'm thinking it's looking easier to disengage the lights , swap in a normal front wheel , clip on a Fly 6 plus some front light and be done with it. I have been running hub dynamo lights for about 12 years and love them. The time lost is negligible, if fact it is time gained because I never have to put them on or off the bike, or re-charge them or change batteries. My lights turn on or off automatically at night & when going through tunnels or under dark trees. On two bikes used almost every day for 12 years we have only had to change one back light, one front light and one bulb in the other front light. I really notice the difference on overnight/audax rides, at about 3-4 am the other riders have to stop to change batteries etc, I just get a short rest. I recently re-built one of the wheels, the rim had worn out but the hub and dynamo are fine. There's no doubt there are some benefits to dynamo hubs. But that isn't the question here, all I want is to be rid of the dynamo hubs resistance to rolling, and making use of the existing lights; but run off batteries.